the lowbeam headlamps may not be switched on automatically if there is fog, snow or other causes of poor visibility due to the weather conditions such as spray. There is a risk of an accident. In such situations, turn the light switch to . setting. 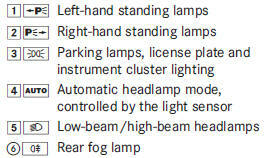 The light setting is automatically selected according to the brightness of the ambient light (exception: poor visibility due to weather conditions such as fog, snow or spray): • SmartKey in position 1 in the ignition lock: the parking lamps are switched on or off automatically depending on the brightness of the ambient light. • With the engine running: if you have activated the daytime running lamps function via the on-board computer, the daytime running lamps or the low-beam headlamps and parking lamps are switched on or off automatically depending on the brightness of the ambient light. 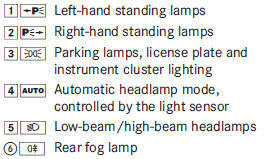 ■ To switch on automatic headlamp mode: turn the light switch to . : The daytime running lamps improve the visibility of your vehicle during the day. The daytime running lamps function is required by law in Canada. It cannot therefore be deactivated. running lamps/low-beam headlamps go out after three minutes. on the daytime running lamps and parking lamps. If the engine is running and you turn the light switch toL, the manual settings take precedence over the daytime running lamps. The daytime running lamps improve the visibility of your vehicle during the day. To do this, the daytime running lamps function must be switched on using the on-board computer . useful function in the event of rain and fog. The rear fog lamp improves visibility of your vehicle for the traffic behind in the event of thick fog. 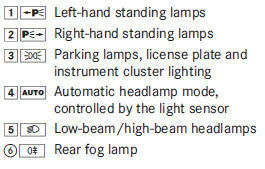 Please take note of the countryspecific regulations for the use of rear fog lamps. ■ To switch on the rear fog lamps: turn the SmartKey in the ignition lock to position 2 or start the engine. ■ To switch off the rear fog lamp: press the button. ■ To switch on: turn light switch to . Switching on the standing lamps ensures the corresponding side of the vehicle is illuminated. 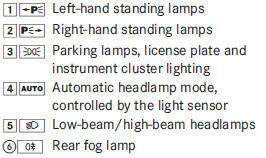 ■ To switch on the standing lamps: the SmartKey is not in the ignition lock or it is in position 0.